When I moved to DC in 2000, it was just about the worst move ever. We were dragging a trailer in my 92 Ford Explorer, and the transmission died in Cumberland. I had just found out the job I came here for had evaporated, that I couldn’t get out of my lease, and now I was facing a $1,000 car bill and three days stuck in Cumberland while my transmission got fixed. 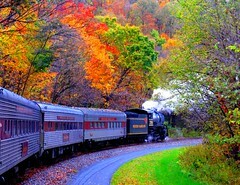 My cousin and I tried to make the most of it, and we took a trip on the Western Maryland Scenic Railroad captured here by Flickr user LaTur. The trip on the restored railroad is a beautiful one, winding through the hills of northern Appalachia through the trees and scenic views. This weekend, I can only imagine, was a beautiful one to take the train, as we’re having just about the most picturesque fall I can remember in my near-decade of DC life. They do Saturday Murder Mystery events with a ride on the train and dinner. Go. Feel wrapped in the anachronism, and just step out of reality for an evening. This sounds awesome! I had no idea they did Murder Mystery events on the train. Thanks for sharing.